I was lucky enough to score some dried and crushed grape seeds and skins from a local wine maker. He didn't need them and was happy to gift them to me. He wanted to know if I can use them in soap. I said why not? They will make some nice exfoliating soap for those that work with their hand and get them dirty. I made this handcrafted soap with mechanics, chefs or gardeners in mind. It washes away grease, grime and dirt and doesn't strip the skin. Since grape seeds don't have much of a scent, I added just a touch of a wine fragrance that smells like fine, well aged wine. 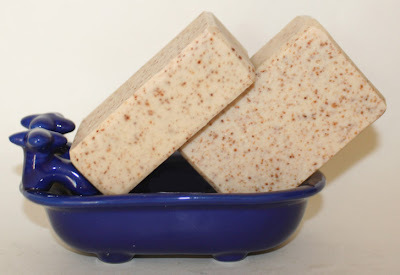 The soap is a creamy tan color naturally. Buy this soap for a friend or get one for yourself and get your skin really clean. This is what the Grape Seed Soap looks like.